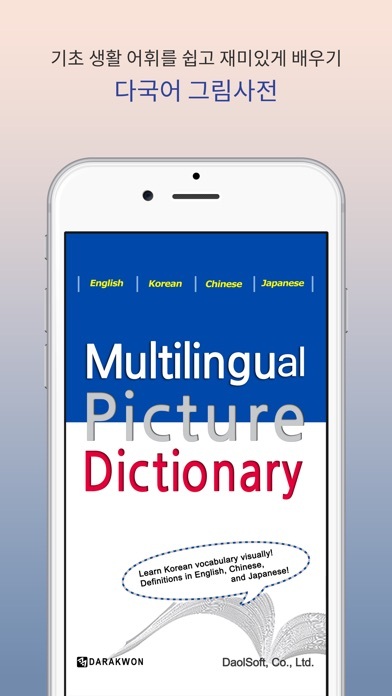 This app is great for learning vocabulary quickly and easily. The pictures are divided into categories by themes such as school, transportation, food, etc. 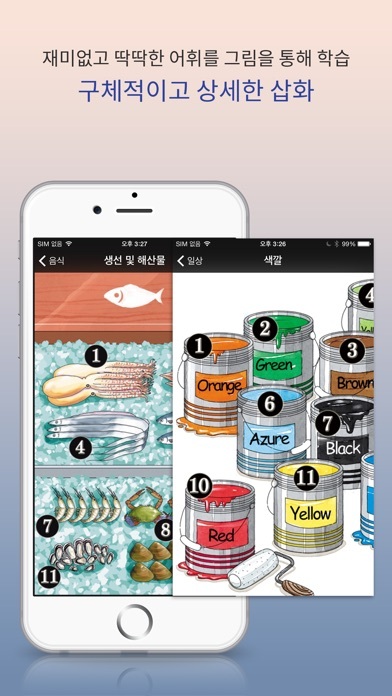 Instead of separate pictures for each item, the single scene helps you remember each item in context with similar items. 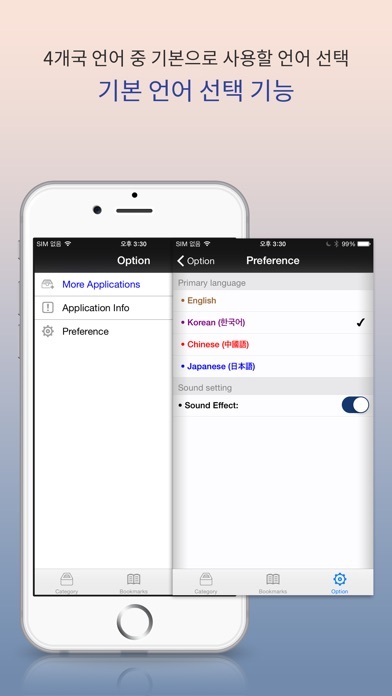 The voice samples also help with proper pronunciation. 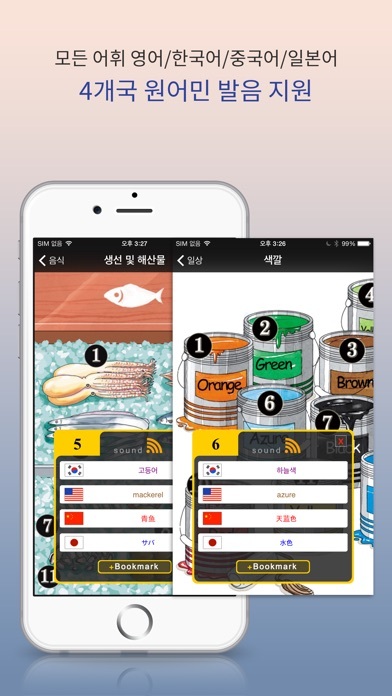 I am a native English speaker who can speak Japanese and is learning Korean. I hope to use it for Chinese later as well. It is well worth the money especially if you are interested in multiple languages. 프리버전을 해보고 맘에 들어서 질렀습니다. 지금 기초적인 외국어를 배우고 있는 분들뿐만 아니라, 해외에 살고 있는 사람에게도 유용할 것 같아요. 의사에게 진찰을 받으러 갔다가 목이라는 말이 생각이 안 나면 재빨리 열어서 단어를 찾아 말해줄 수 있으니까요. 그런데, 그림들이 전부 다 일러스트인데 왜 음식란의 '과자류' '한식' '양식' 등등만 사진으로 대체되어있는지...... 되도록이면 전체적인 통일성을 위해 이 부분도 일러스트로 대체해주셨으면 합니다. 그럼 아낌 없이 별 다섯 개를 드릴 수 있을 것 같네요. And it's the first run. I'd like to see how it will be improved. 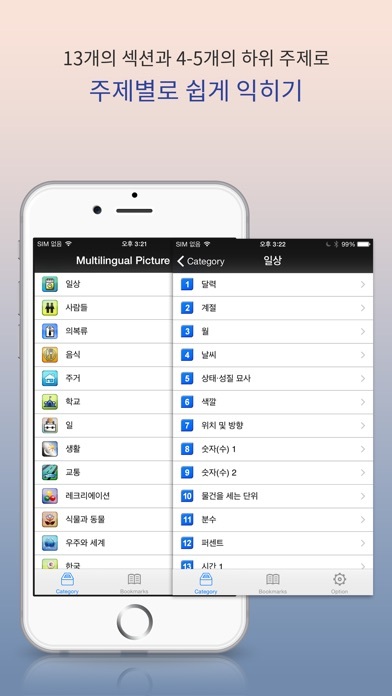 Easy to use, and you can use it for 3 different languages. I'm learning Chinese-Mandarin and it's been a big help.